Holiday gifts. Everyone. Ornament greeting card. So you just had a baby this past year and you sent out the birth announcements, but your kid is much older now and you want to send a picture with this year's holiday card. You also want to send a small gift to some of your friends and family that's fun and unique without breaking the bank. If you'd like to kill two birds with one stone, check out this holiday ornament card from 2Peas1Pod. My favorite baby announcement company will custom design a holiday card for you with a picture that can be punched out and converted into a tree ornament. They'll also do regular holiday card if you want, but this might be something a little more special than a fruit cake for the aunts and uncles. 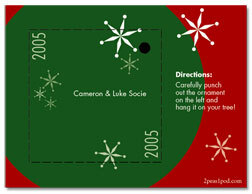 Check out all the holiday card options at 2Peas1Pod.com. Also on MDD - Birth Announcing.